In some ways, there are no words to describe Expo West. Cynthia and Channon, and various companies, had told me about the insanity that is the Natural Products Expo, but I just didn’t get it until I was there. The Gluten Free Certification Organization booth was down in the basement, otherwise known as the Hot Products Pavilion. For the most part, there were not big companies down there. The nicest thing about being downstairs was that we actually had time to talk to people. Upstairs, unless you had one of the gigantic booth spaces and lots of people to man it (like Bob’s Red Mill did), you could never talk to anyone for more than a few seconds because there were just too many people. There were lots of people downstairs, but less, and it was a little bit different atmosphere. To one of the companies that produces packaging, I said “downstairs is Six Flags; upstairs is Disneyworld.” A pretty accurate statement, I believe, as it is a madhouse downstairs, but a madhouse times 20 upstairs. Being in the basement was great for us, since talking to people was the whole point of us being there. We were educating the ingredient suppliers, manufacturers, and retailers and buyers about the Gluten Free Certification Organization, what gluten-free really means (or should mean, at least), how to achieve it, and the steps to and benefits of certification. Are you a little confused about who GFCO and GIG are? 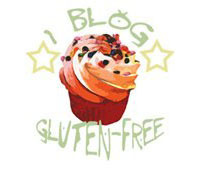 GIG, or the Gluten Intolerance Group of North America, is a 501c3 non-profit support group for persons living with celiac disease and gluten intolerances. GIG is very active in increasing awareness and educating doctors, patients, consumers, manufacturers, restaurants…everybody, really. There are many local branches across the United States. GIG also runs programs that make all of our lives better, like the Gluten-Free Restaurant Awareness Program (GFRAP), the Gluten-Free Food Service Accreditation program (GFFSA), some gluten-free kids camps, the Annual Education Conference (will be in Orlando July 1&2), and the Gluten-Free Certification Organization (GFCO). The GFCO is not just an endorsement program. GFCO assesses the risk of all ingredients for a product/manufacturer, and goes out to the facility and does a thorough testing process to ensure that the product is gluten-free. In addition to yearly or more frequent audits, the products are constantly tested. GFCO even pulls products off the shelves to have tested (I helped pull some for testing while at the show). If any product tests over 10 ppm, then GFCO can (will, and has) force a recall or keep the product from being shipped. Why 10 ppm? Why not 0 ppm? Zero is unachievable, and un-testable. Currently, the US has no definition of gluten-free, because the FDA is dragging their feet and didn’t follow through with their promise to have a definition out in 2008. The proposed definition is that something cannot be labeled gluten-free unless it contains under 20 ppm gluten. Now, don’t freak out. PPM = parts per million. Think about a million pennies, and how little a portion of 20 pennies would be in comparison to the rest of that million. Currently, the Codex standard is 20 ppm. It used to be 200 ppm. Studies have shown that 20 ppm is below the threshold that would cause damage in the majority of celiacs. That’s not good enough for GIG and GFCO, so our companies’ products must fall below 10 ppm. Many of them fall below detectable levels. GFCO is that outside body that performs the checks and balances, and polices the companies to make sure they are doing what they say, which is providing us with gluten-free products. 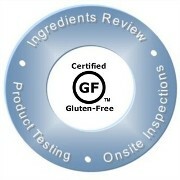 When we see that circle GF symbol, we know that those products are safe for us. This entry was posted in 2011 Expo West. Bookmark the permalink.